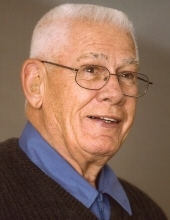 Robert D. McKenzie, 93, of Iowa City, died on Monday, January 21, 2019 at Mercy Hospital Hospice in Iowa City, surrounded by family. A Memorial Service to celebrate Robert will be at 2:00pm on Saturday, January 26, 2019 at Lensing Funeral and Cremation Service, Iowa City. The family will greet guests from 1:00pm until the time of the service. Bob was born on November 8, 1925 in Tonkawa, Oklahoma, son of Ola and Isabel (Ingels) McKenzie. In 1944, he served in the US Army and was discharged in 1946. Bob attended the University of Iowa and lettered in football for two years before graduating in 1950. On July 22, 1950, Bob married Norma Gerard in Iowa City. For 31 years, Bob worked for the Cryovac Division of W.R. Grace, retiring as Plant Manager of the Cedar Rapids manufacturing plant in 1988. Bob is survived by his two sons, Dave (Dawn) McKenzie of Iowa City and Dan (Tammie) of Carroll, IA; grandchildren Erin (Dave Brown), James (Jenny), Barbara, Nora, and Robb; great-grandchildren McKenzie, Izzy, Charlie, and Lucy; brother John W. “Bill” McKenzie of Braman, OK; and special friend Fran Nussbaum. He was preceded in death by his parents, his wife Norma and his brother Richard. To send flowers or a remembrance gift to the family of Robert "Bob" D. McKenzie, please visit our Tribute Store. "Email Address" would like to share the life celebration of Robert "Bob" D. McKenzie. Click on the "link" to go to share a favorite memory or leave a condolence message for the family.